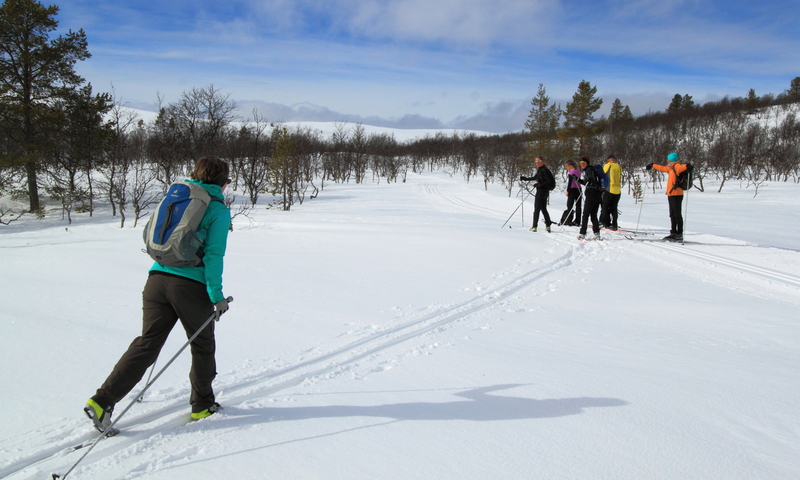 This ski week program is an excellent way get acquainted to cross-country skiing in Lapland, scenic and peaceful Northern Winter Wonderland. We start with basic exercise and when skiing skills are getting better every day it is time to go further into the woods and fells. After two training days in the vicinity of our basecamp we head to a 4 days (3 nights) ski tour in stay overnight in cosy cottages. We learn traditional ski style and after learning basic skill we do relaxed ski trips having coffee and lunch breaks in small cabins and Lappish tepees. After a brisk skiing day we chill out in a bath in a sauna and have a delicious dinner. During the week we learn also about Lappish nature, culture and traditions. Day 1 – Arrival Day: Transfer from Kittilä airport to Jerishovi Lodge by Jerisjärvi Lake next to Pallas‐Yllästunturi National Park. After the evening meal introduction to the week program. Evening meal and overnight stay. Day 2 – After breakfast, we get acquainted with our ski equipment and start with basic practices on the yard and the frozen lake close by our basecamp. On the flat lake surface, we practice cross‐country skiing on and off ski tracks. We also learn how to fall safely and get up after that. In the afternoon we make a break for lunch inside and after the break continue the practice. After a day outside it is time for hot drinks and sauna. Day 3 – We continue practicing more on the ski tracks in a bit hilly ground. Our practising is still basic training and we look into the kick and slide techniques. Day distance today is a few kilometres. Lunch and coffee/tea breaks at our base camp next to the lake. Day 4 -Our skiing skills are getting better every day and it is time to go even further into the woods and fells. We pack the gear and wear we need during the rest of the week and ski to Pallasjärvi cabin. The luggage is taken there by service transportation. There is running water and electricity in the cabin but the toilets are outhouses and the sauna is also without running water. Accommodation is sleeping bags in rooms for 2-6 people. Dinner and sauna. Day 5 – The skiing tour continues from Pallasjärvi to Harrisaajo cabins. The cabins have electricity and running water. Dinner and sauna. Day 6 – Second day in Harrisaajo. We do a skiing day trip in the surrounding area. Dinner and sauna. Day 7 – On the final skiing day, the group returns to Pallastunturi. At the Information centre of the Pallas-Ounastunturi National Park, we will have the possibility to learn more about the nature of this area, – it’s flora and fauna – from an exhibition and slide show. From the centre will be picked up and transported back to Jerishovi lodge. Dinner and Sauna. Day 8 – Departure day. Breakfast and transfer to Kittilä Airport. The program above is an example program and routing. Maximum group size is 12 persons. Due to the weather conditions and other circumstances, minor changes to the program are possible. There is limited mobile coverage on the area. In some areas where you cannot make a phone call, you could anyway send/receive SMS.